The Ultega Jumper Trampoline with safety net is one of the best backyard trampolines for many reasons. They are designed with safety and durability in mind. This is truly an affordable and healthy addition to your backyard toy selection. Trampolines are not only fun, they are great exercise, whether you are a kid or an adult. Strengthen your muscles, while increasing your stamina and balance with a trampoline workout. Burn those calories in a fun way. Ten minutes on the trampoline has the same positive effects as a 30 minute jog but without the wear and tear on your joints. Improve balance, cardio and motor skills in the privacy or your own backyard. The kids won’t have any trouble sleeping at night after a good trampoline session. 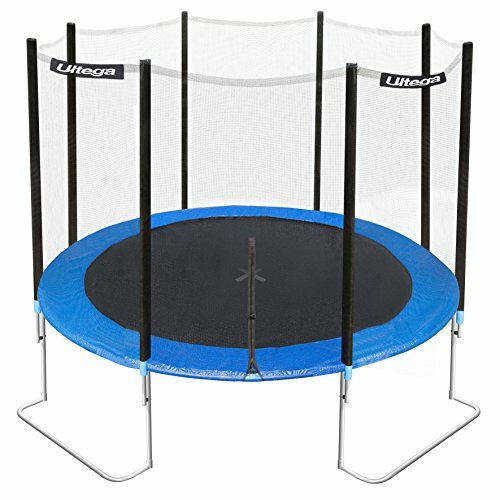 This is an affordable and well made trampoline. It has a galvanized steel frame with a maximum user weight of up to 200 pounds. It is surrounded by a high quality net for maximum safety. It is available in multiple sizes from 6 to 14 feet. This is the latest and safest trampoline in this affordable price range. These are trampolines that are designed for outdoor use only and the recommended age is three years and up. The galvanized steel frame prevents these units from tipping over and the safety net includes eight padded poles to ensure the highest level of safety. The frame is about 30 inches high and the mat is attached to the frame by 64 springs. Having fun on the trampoline is also a great workout. With your purchase of an Ultega Trampoline Jumper you will get a diagrammed step-by-step instructional guide with five suggested exercises to get the most out of your trampoline. Kids backyard trampolines become the go-to toy for exercise and fun. They are actually so much fun that the kids won’t even realize that it’s good for them. Don’t worry mom and dad, you can have fun too.